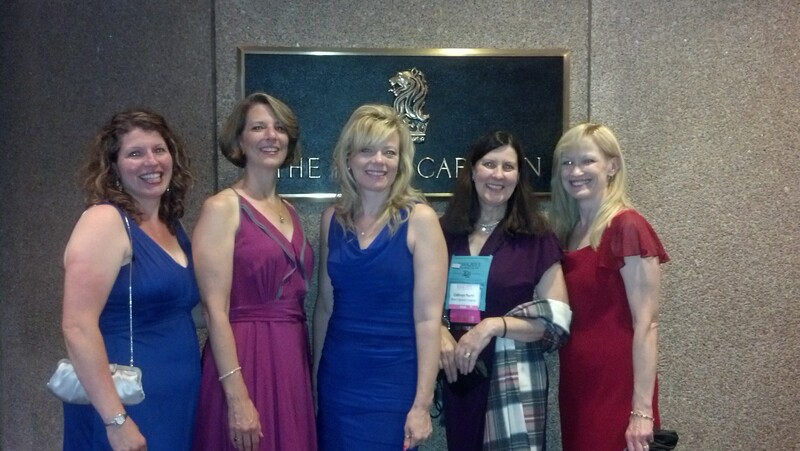 There’s something magical about the Romance Writers of America’s Annual Conference. Fifty-one weeks a year, we writers live in semi-solitude, with little but our characters and our neuroses to keep us company. (Or at least that’s how I feel fifty-one weeks a year.) But then conference week rolls around and we’re allowed to break free. Because so many of those 2000 writers have gone home and shared their experiences, I’m going to spare you a blow-by-blow breakdown. Instead, I’m going to steal a page from my friend, romance writer/review Penny Romance and present awards for my RWA National highlights. Most Awesome Career Perk EVAH! : I can count on one finger, the number of times my book cover has been featured on an elevator door. I cannot count how many times I purposely disembarked on the Atrium Level to stare at The Courage to Say Yes. Most Adorable Acceptance Speech: Upon collecting her Booksellers Best Award for Best Long Contemporary (beating out such great writers as Jennifer Probst and Brenda Novak), my good friend Cathryn Parry announced “I never win contests!” Her smile lit up Atlanta. BTW, if you haven’t picked up The Long Way Home from Harlequin Superromance, you should check it out. I wasn’t up for any awards myself this year – but that’s alright; I loved seeing my friends being honored. My year will come! Best Un-official Party: The HQ Community PJ Party. Guests wear pajamas, eat popcorn and indulge in an open bar. What more can I say? Best Official Party: The Harlequin Party. This year’s gala was held at the Ritz Carlton and featured a giant chocolate dessert bar. This party is the place to kick off your shoes and dance the night away. Which, by the way, most of us did. Leading to the next award. Stupidest Dance Injury in the World: My neck – thrown out of joint thanks to my overly-enthusiastic head banging during the 80s Hair Band Set. Best Party Honorable Mentions: All the other publisher parties I wasn’t invited to. My friends told me they were equally fun. Best Speech: Kristin Higgins. I’ve been attending RWA for several years now. Never has a speech moved me to tears like Kristin’s did. Her speech managed to be funny, moving and inspirational. Much like her books. I feel richer for having listened to her. Her best advice by the way – writing is supposed to be hard. If it’s going easy, you’re not pushing yourself to do your best. Habit I’d Most Like to Adopt in Real Life: On Saturday afternoon, the Mills & Boon editorial staff treated us to afternoon tea at the Ritz. Wait staff poured our drinks while we laughed and ate the most marvelous lemon cake ever. (Those of us forced to eat gluten free just ate frosting.) It’s a lifestyle I could get used to. Most Glamorous Almost-Rita Winners: My fellow Harlequin Romance authors, Susan Meier, Jessica Hart and Barbara Hannay were all up for RITAs. My fingers were crossed for a trifecta of Rita wins. Sadly, none of them brought home a Golden Lady. Susan and Jessica, however, looked fabulous. All three are winners regardless. Favorite Non-Conference Field Trip: On Thursday afternoon, my roommate Michelle, along with paranormal authors Nina Jade Singer and Lesley Mathews, took a break and toured the Coca Cola Bottling Factory. Did you know visitors are invited to taste all SIXTY flavors of soda that Coca Cola sells around the world? The four of us did. Here’s a tip – don’t drink Inca Cola. It takes like nail polish. Best Conference Posse: Every author I met. It never ceases to amaze me how giving and generous the romance-writing community can be. I was especially thrilled to meet up with my online besties Donna Alward, Julia Broadbooks, Shirley Jump, Aimee Carson, Cindy Jachrimo, Jenn Probst and Wendy S. Marcus. Most Anticipated Event Post-Conference: Spending the week immersed in writing and writer’s talk is awesome, but there’s a reason I spent the other 51 weeks in solitude. I was never so grateful to see my own bed as I was Sunday night. Home Sweet Home to be sure. At least until 2014 when the San Antonio Conference rolls around!